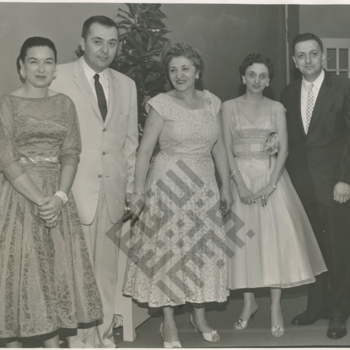 A photograph of Virginia Rabil Mansour and Ernest Mansour in a house with a Christmas tree in the background. The caption provided reads "Dad & Mom at Uncle Ern's." A photograph of Virginia Rabil Mansour standing in front of a painted portrait of her husband, Ernest Norman Mansour, Sr, who passed away in 1983. Also visible are a number of family photographs on the same wall. A close-up photograph of a photograph of Virginia Rabil, later Virginia Mansour. The photograph that this image was taken from is linked below. A photograph of Virginia Mansour sitting in a swamp. A photo of Virginia Mansour (right) with Ernie Mansour's wife at the beach.